I've been watching a trade for several weeks and yes, there is part of me that regrets not playing it as it move exactly to the level that I felt would be a compelling area to short. In effect, missing out on the move higher has actually been good because I've had to remain committed to trading the Market Vectors Indonesia etf according to the plan I identified weeks ago. We are now very close and therefore I have begun positioning in the name for a pullback. I believe IDX will encounter some significant resistance at $30.50 and will then turn lower to the $25.00 level. Update - I am close to being stopped out of the INTC short trade, but will continue to hold until taken out. As good as this morning looks, there is always Turnaround Tuesday to being the market back to reality. I took a month off last month and it was very good to have a break. I'm excited to "get to" put this together and see what the data is telling us. As of Friday, October 21, the equity markets have stabilized a bit after a thrashing and we are back to the 1235 level on the SPX. Earnings have been mixed and there have been some misses that shocked the world and then some beats that have been quite good. Overall, I didn't expect this earnings season to be all that bad, but the next one should be more than interesting. Investing in these markets is quite perilous as 2% moves up and down intraday are not signs that we are investing in a healthy market. Rumors and rumors of rumors result in absolute face-ripping turns that can leave your rear and your portfolio aching. It is important that you slow down and remember the risk rather than focus on the money you are not making by being in a trade. I've had several email conversations this week with people that were upset they were "missing it". Don't worry, there will be another trade after that one. 2011 continues to track right on par with 2010 on a non-seasonally adjusted basis. From an economic perspective one might suggest that this is bearish, yet oddly I find myself noting that despite all of the ominous double-dippiness that I see, it is quite positive to see that we are tracking right along with last year and not falling. This is based on the assumption that many folks have that 2009 and early 2010 were essentially pulling forward all sorts of demand (and that was the case for cash for houses and cash for clunkers), but at least in the midst of this "pull forward" 2011 has been able to match that transport demand punch for punch. What does this graph tell us? Simply that we are better off now than we have been in terms of moving stuff compared to anytime in the last 2 years. 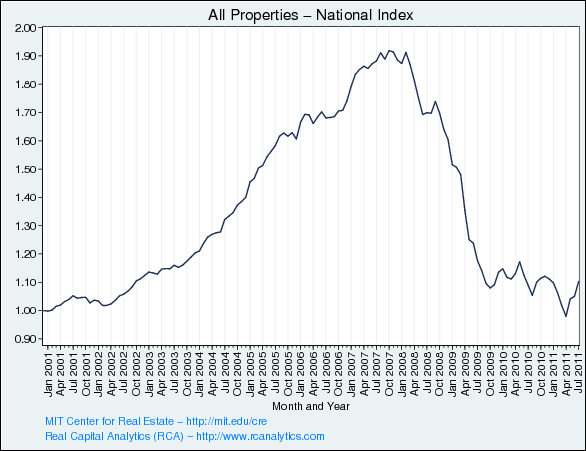 It is not a huge revelation to note that we are not near the 2006/2007 excessive peak of everything. Crushed Stone - I've finally found a reporting source for crushed stone transportation since Railfax went to a subscription model (greedy 1%ers!) Here we find much the same that 2011 is right on target with 2010. 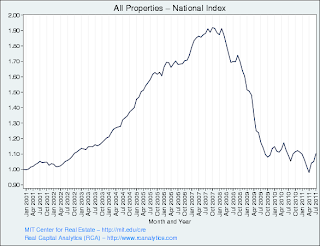 Unfortunately for commercial builders, this indicator is telling us that there is no real demand for commercial building at all. Here is nice graph I pulled from the Railtime report that highlights a concerning trend. See the red line there? That is showing that since March of 2009 manufacturing inventories were at significant lows. As we've mentioned often, the red line demonstrates that the climb in inventories has fueled much of the consumption of raw materials and the illusion that the economy is a lot better. Now that we are near peak levels reached in 2007 and 2008, where do we go from here? The WLI from ECRI continues to show weakness and point toward a "new recession". 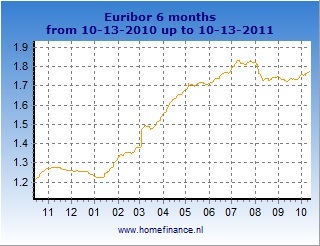 Euribor continues to remain stubbornly high for this type of credit environment. Euribor is the rate in which banks can borrow from each other in Euros. While the absolute levels here are nowhere near the highs of the past in "normal" credit markets, given the scary lending environment the Eurozone is in now, the uptick in rates over the last two months is indicative of the stress between counterparties. Despite being told that a solution is in the works to the Greece solvency problem, we've seen other dominoes fall. The "dominoes" are weak banks that are exposed to bad sovereign debt. These include Dexia, and a few other French banks. These rates seem to be on their path higher.....again. I'll be very interested to see the results of next months report from the UCLA/Ceridian Fuel Index. Readers should recall that the Ceridian Index monitors the fill-ups of truckers across the country and in turn, this fueling activity gives us an idea of how the economy is doing in real-time. Over the last couple of months we've seen a slow-down in these figures and this is an indication that a recovery is on the skids. The Monster.Com Index shows a reading of 148 which is actually very good. The print represents a 7% year-over-year gain, but more importantly the figure is the highest level we've seen in a very long time. The Monster.Com Index measures the number of on-line job listings available. Obviously in this graph you can tell that September is seasonally the most active job posting month, but when we continue to hear that there are just no jobs available, we must question the common wisdom. Perhaps some of the OWS guys can use some of their down time to hop online and apply for one of those "fair wage" jobs they are demanding. Home sales prices are beginning to fall again. The late September release of the MIT/Moody's Transaction Based Index show some positive news, however the release captures data from the month of July. The month of July noted an increase in transaction price of 5% which is quite good given the circumstances of the economy. Obviously the follow on months of August and September will be critical and we'll keep watching them. Alan Greenspan better take notice as scrap metal prices are plummeting. Since their peak in February, metal prices have fallen. Mr. Greenspan used scrap metal as an indicator for the health of the economy. I'm wondering how healthy the economy looks given the almost 20% drop in the index. Bloomberg's Financial Condition Index is also suggesting that we are in recessionary territory. Any level under 0.00 gives us the information that the economy is contracting. After reaching multi-year lows in February, the BDGI seems to have found some footing. and the spot rate shipping index has almost doubled. Unfortunately we need to resist the desire to rush out and buy shippers as I recently read a story that noted that shippers have another huge delivery of ships coming online in the next several years. The dance of the USD continues as each Eurozone fix rumor creates massive gains and losses in the USD. September's spike in the dollar has been met with October's destruction in the greenback. 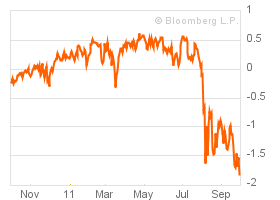 The volatility will continue till we see some sort of resolution from the ECB, IMF, and Euro countries. A very cursory look at this chart suggests that their may be a small move higher in the dollar and then a continuance of the larger trend down to retest 74. If that does happen, the equity markets will enjoy a healthy rally. Well I've kept the Coppock Indicator warmed up and up to date despite my belief that it is pretty worthless. I've tracked this indicator for more than a year now and as I noted when I started, it didn't have much predictive power, and doesn't seem to have much still. Recently I did a post on the notion that the slope of the moving average had something to do with the predictive capabilities, but I'm not sold. Needless to say, the Coppock Indicator for September was still in "sell" mode and thus the big rally over the first weeks of October would have been missed. Coppock needs a close over 12,500 to earn a buy turn signal. As bearish as I sound on many posts, I am not as bearish as I could be and actually feel a bit positive. Employment measured in the Monster.com Index is up, real estate transactions (commercial) are getting better, rails are shipping as much or more than last year, and input costs are falling (copper, scrap, etc). There are serious headwinds, most notably a lack of any confidence in the sustainability of the "recovery" and of our leadership in the political sphere. I think this is exactly the kind of environment that could foster upside surprises in terms of economic performance since everyone is just so darn pessimistic. The last two weeks of rallying has saved the bulls and charts have made some really compelling progress to bolster the bullish case. As I type this, I am reminded that these markets have tended to move into territory lately that "bolsters cases" and then suddenly destroys that case in an instant. With that in mind we'll pretend that the Eurozone issues don't exist and we're simply going to look at the charts and attempt to discern where we could go! $SPX looks strong here for a move to the 1275 area as this would be essentially the 200 day moving average. As I discussed in the earlier USD chart, this type of move higher in SPX would result as a drop in the USD paved way for the equity market rebound. 14/40 CROSSOVER - On a much longer time frame we get a sense that perhaps all things are not well with the indices as we see that on the 14/40 chart of $SPX that the 14 Day EMA on a weekly chart is still below the 40 day EMA. This is essentially still a hold bonds not equities signal here. While not pictured here, the MACD is turning up, but that doesn't change that the longer term call here is still bearish till we see a cross back over. Finally, let me share with you a couple of perspectives on specific names. FCX - Put this one on your watch list. I have been playing this one long and short all week, but am out of the name as of today. The move into the $36 area from the $34's yesterday makes this one in no-man's land. However, if we do see a continued rally in the Euro, we'll see commodities run up and FCX has been strong despite falling copper and gold. A continuation of this could lead to much higher prices in FCX near the $45 level. If we get a move to $38.25 and it is repelled, it might be a good play to short. If $38.25 holds well, a short trade may be the play with a low $32 handle as a target. In the near term, here are the levels I am watching. INTC - While the FCX play is bullish I have been watching and shorting Intel. Oddly, I actually like INTC alot, and had identified it as a great "defensive" name due to the high dividend when the stock was trading near 19.00. Unfortunately I missed that entire run as I was over thinking it. Now, despite my admiration for the dividend and the good results the company posted, I find that a 30% + move in a couple of weeks is just too much. Look at how INTC has struggled at the $24 level. If this isn't a good opportunity to short, I don't know what is. I'm setting a tight stop at $24.75 and letting this one go with a target of $21.50 as a retracement to the 50 D MA and then possibly a $19 target again where I'd then flip and go long. Finally, you'll note on the chart that INTC is at a point that is 2 standard deviations above the longer term average which is essentially the 200 day. This seems that the move up has been a bit overdone, therefore it reinforces the bearish posture in this trade. Well, that's enough for me today. Please check out the blog often as I'm back and enjoying my publishing outlet again! And just as I post the most recent article about Bill Dudley, the NY Fed Chief putting on a PR blitz to save the reputation of the Fed and inform the public about the good works they do, we get another gem that reinforces just how rigged this whole system is. FORMER KANSAS CITY FED PRESIDENT, THOMAS HOENIG NOMINATED FOR FDIC CHAIR BY OBAMA. Hoenig, who has served as President of the Kansas City Fed for 20 years and submitted his resignation on October 1st of this year. Is it odd that Hoenig would retire only to move into the leadership role at the FDIC? Perhaps not, however this interesting story about Bank of America, highlighted below, has me thinking a bit more now that I have noted the story. When I worked at the hedge fund back in the day, you could tell when someone was about to be asked to leave the firm (fired). Typically, the timing would coincide with any challenge or disagreement with the CIO on any investment decision or issue. Once that event occurred the poor trader or manager was doomed to pack up his belongings within 30 days. "Bank of America Corp. (BAC), hit by a credit downgrade last month, has moved derivatives from its Merrill Lynch unit to a subsidiary flush with insured deposits, according to people with direct knowledge of the situation. The Federal Reserve and Federal Deposit Insurance Corp. disagree over the transfers, which are being requested by counterparties, said the people, who asked to remain anonymous because they weren’t authorized to speak publicly. The Fed has signaled that it favors moving the derivatives to give relief to the bank holding company, while the FDIC, which would have to pay off depositors in the event of a bank failure, is objecting, said the people. The bank doesn’t believe regulatory approval is needed, said people with knowledge of its position." See, the FDIC looks at these transfers of derivatives into the bank holding company and sees these as potential claims against bank assets. The counterparties that entered into these with Merrill Lynch love this because they are getting a "better" rated counterparty with much deeper pockets. Isn't it interesting that the FDIC and FED are split on this approval and a 20 year veteran Fed President would suddenly be nominated to a key leadership position at the FDIC? While it is not related to this story in any way, you just can't avoid a Federal Reserve connection or Goldman Sachs employee in any important office in our government. While he never worked at Goldman, you've got to know that our friend Herman Cain was on the Board of Directors for the very same Kansas City Federal Reserve in the early and mid 1990's. I took a much needed month off from writing the monthly reports and I feel refreshed and feel like I have a better perspective on the market due to the lay off. I'm dealing with extended family health issues so I seem to have much fewer hours to devote to writing. I will attempt to write less long, but more frequent posts in the next month. The monthly update should be finished tomorrow for some weekend reading. Are you getting the idea that the FED is putting the full court press on the public to encourage them to see the side of them that is benevolent and for the little guy? Yes, me too. I mean how on earth could we possibly believe that the Fed had anything but the common folk's best interest at heart as they engineered too major stock market collapses and one real estate implosion in the last decade? Dudley is one of the 3 Fed chiefs that actually matter, the others are Fed Chairman Ben Bernanke and Janet Yellen who is the Vice Chair of the Federal Reserve Board. The article notes how hard Dudley is trying to get out with regular people and explain how the Fed is helping them. Clearly he hasn't internalized the criticism of the Fed and questioned if anything they have to say might be true as the Fed continues to squeeze investors that use fixed income investments or even savings accounts as part of their portfolio. Dudley obviously believes that old ladies should need to take more credit risk or simply cut out medical coverage or incidentals like food or shelter rather than raise interest rates. Dudley's moves highlight the growing importance of the public's view of the Federal Reserve given that it has now become politically acceptable to believe that the Fed is a part of the financial crisis. Ron Paul has a book about Ending the Fed, Rick Perry also is quite wacky crying that the US needs to get rid of the Fed. I've even seen a sign or two in the OWS demonstrations that actually reference the Fed. A growing move to understand and dismantle the Fed is absolutely not in the Fed's best interest..... nor in the interest of the banks and uber-wealthy 1%ers. I expect more concerted efforts to humanize the Fed and make Joe 6 Pack feel happy to have a benevolent Fed on our side. INFORMATION FLOW OR BIG BROTHER? Now, add this to the recent "rumored" request by the Fed to begin a project to scan and analyze references to the Fed in social media and the blogosphere in order to capture market sentiment, I think you have a situation that could be ultimately bad for all of us in the general public. Clearly the conspiratorial side of me feels like the Fed has sinister intentions when they move forward with this project, however, the NY Fed assures us that it is all good, why worry? "The project reflects its (NY Fed's) commitment to “improving its communications and engagement with the public in order to enhance and improve the public’s understanding of its activities and the role it plays in supporting the U.S. Economy,” according to a Fed spokesman’s statement." I'm sure the Fed's efforts will be passive and harmless and simply used for data collection. Having said that, I'm sure it won't be long till a blogger or Facebooker is threatened with jail or lawsuit for disparaging the Fed and invoking some type of crisis of confidence relate to their posts. Think it can't happen? Look no further than the Eurozone's sovereign debt issues where investors and "evil speculators" are targeted for stating that the sovereign countries are broke and the bonds are a poor investment. Give the US debt crisis a few more years and we'll see how "passive" this monitoring becomes. Tom Keene from Bloomberg interviews Lakshman Achuthan, co-founder of the Economic Cycle Research Institute and they talk about the outlook for a U.S. recession. I don't know how it is possible to have a view that is bullish in this environment. I traded emails today with a person that is convinced that they need to be fully invested in the market and were attempting to find high dividend payers. Fine, I understand that if you are a mutual fund manager. I am not ok with that if you are an individual investor. In this kind of scenario you could lose 20% or 40% in a matter of a few months! A 4% dividend isn't going to make up for that kind of loss! So, as we examine this video, keep in mind the comments from Warren Buffett the other day, as he tells us that there is not a recession. Here are just a few of the interesting tidbits from the video. "This is not a double dip, it is a new recession." "If you think this is bad, we haven't seen anything yet." "Profits can be good, but I don't know where stocks go. We expect more frequent recessions so you have an elevated stock risk premium. Look at the case of Japan after the bubble burst, it is not that they didn't make any money, but the Nikkei is a quarter of the value." Can yields go lower? -- "Yes, look at Japan"
I'm becoming more pessimistic as I see more data from the US that is poor and then we have further deterioration in Europe and the emerging markets. Copper is signaling that things globally are turning anemic. It doesn't seem like the fellas at ECRI believe it's all good. Perhaps just the Warren Buffett rails and insurance companies, and furniture stores that employ 70,000 are doing fine. I'm not a huge fan of ECRI's cop out that this is not a double dip recession, for them it is a new recession, because I think they missed the signs as the Fed blew up their model (revealing that much of ECRI's data is based on liquidity and credit just like the Financial Conditions Index. Having said that, I believe their models are back to pointing in the correct direction because the Fed simply had to quit fueling the economy with additional printed propellant. It won't be long until the Fed is back again with the Mother of all Stimuli. If we see significant breaks with the Dow with a 8000 handle I think this will allow for the globally coordinated stimulus from all central banks that I've been waiting for. Until then, we'll see support levels fall as the confidence in the US economy falters and the Eurozone mess goes into total meltdown stage. Alas, there won't be the "decoupled" emerging markets to save us either. We better get our deflation hats on, it is coming.